Winnipeg (pronounced /ˈwɪnɨpɛg/) is the largest city of Manitoba, Canada. It is in the eastern prairie region of western Canada. It is often called the "Gateway to the West". Winnipeg is the seventh biggest city in Canada with a population of 633,451 people. Winnipeg has four professional sports teams. The teams are the "Winnipeg Blue Bombers" who play football, the "Winnipeg Jets" who play hockey, the Winnipeg Goldeyes who play baseball and the Winnipeg Alliance FC who play soccer. Winnipeg has four universities: the University of Manitoba, the University of Winnipeg, Canadian Mennonite University and University of St. Boniface. There is a big road that goes all the way around the city. This road is called the Perimeter Highway. The two best known roads in Winnipeg are called Portage Avenue and Main Street. The place where these two roads meet is in the middle of Winnipeg's downtown area. Main Street goes from the middle of the city to the northern part of the city. Portage Avenue goes from the middle of the city to the western part of the city. The provincial premier is a person who makes decisions about Manitoba. Manitoba is the province that Winnipeg is in. Manitoba's provincial premier is Greg Selinger. The premier makes decisions at the legislative building. ↑ Goodhand, Margo (10 October 2012). "Winnipeg Now was 100 years in the making". Winnipeg Free Press. ↑ Williams, Rob (31 December 2011). "Live ... in the Peg!". Winnipeg Free Press. ↑ Kives, Bartley (2 December 2012). "Proud to be Winterpeg". Winnipeg Free Press. ↑ Municipal Manual. City of Winnipeg. 2007. p. 16. ↑ "Census subdivision of Winnipeg". Statistics Canada. Retrieved 3 March 2014. ↑ "Census metropolitan area of Winnipeg". Statistics Canada. Retrieved 3 March 2014. ↑ "Census Profile, 2016 Census Winnipeg Census metropolitan area". Statistics Canada. Retrieved 8 February 2017. ↑ "Census Profile, 2016 Census Winnipeg, City". Statistics Canada. Retrieved 8 February 2017. ↑ "Population and dwelling counts, for Manitoba and census subdivisions". Statistics Canada. Retrieved 6 April 2012. 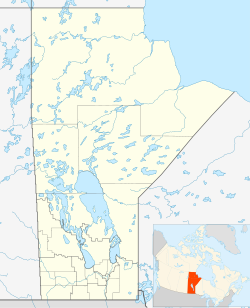 ↑ "Metropolitan areas of Manitoba". Statistics Canada. Retrieved 8 February 2011. ↑ "Population counts, for census metropolitan areas, census agglomerations, population centres and rural areas, 2011 Census". Statistics Canada. 11 April 2012. Retrieved 10 August 2012. ↑ "Winnipeg". The World Clock. Retrieved 3 March 2014. ↑ Imperial Oil website. "Winnipeg History". Retrieved 2008-06-15. ↑ City of Winnipeg website. "Winnipeg History". Retrieved 2008-06-15. ↑ "Population and dwelling counts, for census metropolitan areas, 2011 and 2006 censuses". Retrieved 12 November 2012. ↑ "Winnipeg's History". City of Winnipeg. Retrieved 12 November 2012. This page was last changed on 3 April 2019, at 12:03.